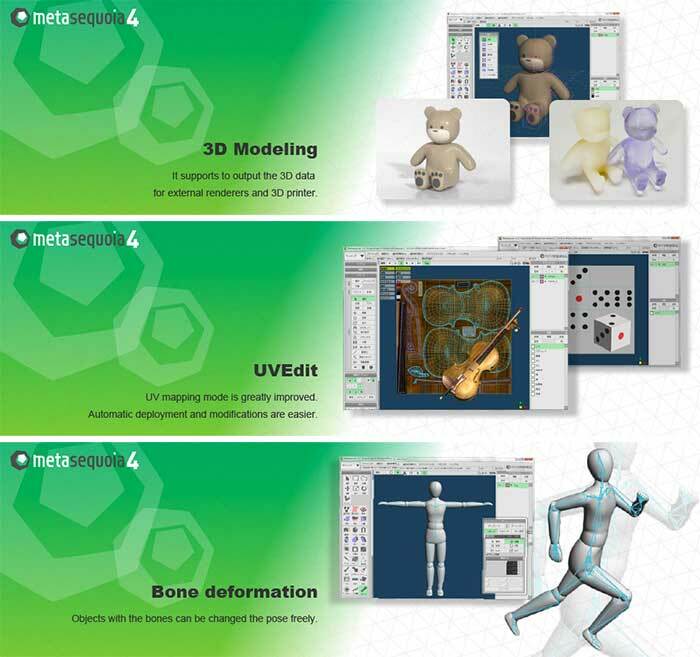 Metasequoia 4.6.8 – Design three-dimensional model. Design three-dimensional model, especially the creation of human characters or animals, requires some knowledge in this area and, most importantly, a set of appropriate tools for the job. For those who did some 3D creations using various specialized software solutions and need to work on them without having to install each program again, a utility such as Metasequoia can be the right choice. This application manages to provide a strong set of features and make them available from a truly friendly interface. There are several ways to operate Metasequoia, namely beginner, Modeling (rope), Modeling (icon) and Mapping. Each of these styles comes with its commands to edit the loaded model, set the right lighting and more. There is a wide variety of objects that you can select and insert into the design as well as some tools that are intended to modify the model you are working. The editing function is equipped with Metasequoia is pretty basic, but nonetheless covers all necessary measures to handle objects, faces and vertices material actions. Each selected portion of the design can be repaired, stored or restored as necessary, and set to be displayed or set as a rotation center. There are many customizations that can be performed on the application from the area ‘Settings’, so you can assign, for example, several actions to mouse buttons and key combinations. Imperfections can be avoided textures and some failures that may occur by adjusting the options Direct3D and OpenGL preview. Taking everything into account, Metasequoia seems to be a worthy alternative to more complex utilities of this sort, especially thanks to the ease of use with good support for a variety of formats that this software can work. Next story VueScan 9.6.19 DC – Scanner software with advanced features. Previous story Infographics Maker – Templates 3.3 – Visualization graphics for Pages. formZ Pro 8.0.2 – Solid and surface modeler.